Wireless keyboards and mice are not on the top of the list in any gamer's buying list, because they don't work well with competitive Multi-player gaming. The biggest issue is the input lag that they produce, but additionally there is the risk of running out of juice (battery I mean) when you are in the middle of a gaming session without even knowing. Hey, who has time to monitor the battery status when you are glued to the screen, right? Besides, frequently needing to charge the wireless products is a pain in the arse. The chances of you forgetting to do it in the night and finding out that you are almost out of juice is common place. Looks like wireless input devices are not practical. So why am I even writing this topic? Simply because, THERE ARE advantages of using wireless input devices (not so much with keyboards though). There is no wire drag with wireless mice. Wire drag is where the wire of the mouse gives a resistance against freely moving the mouse because it drags along the surface (i.e. desk). Most mice these days are braided and that adds more resistance. There are products like Roccat Apuri that tries to bring zero drag resistance to wired mice, but not everybody can get one in their country nor have the space on the desk to keep it. But indeed it is a cheaper fix to the solution. But if you are a minimalist like me (news flash! ), you'd want to go for the real thing. Meaning, a proper wireless mouse. Additionally, it gets you one step closer to getting rid of that wire mess. But does a proper wireless mouse exist? The answer is PROBABLY. The Logitech G602 comes almost close to that throne. 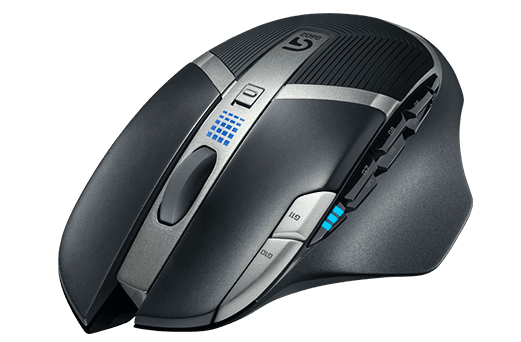 The biggest difference with this mouse is that it allows you to use the mouse for 250hrs non-stop compared to most gaming wireless mice that need charging everyday. That's a high speed mode which is suitable for gaming. If you put it to endurance mode, which is good enough for everything else, you get over 1000hrs of non-stop battery life! Holy McDonald!The batteries inside the mouse are standard AA sized batteries; not anything proprietory. Looks like you don't get any charging mechanism built in to the mouse. You have to charge your own batteries or put new AA batteries every now and then. Costly, unless you have a few Sanyo Eneloop batteries lying around. I do, because I bought 8 batteries for my old Canon SX1-IS camera. The mouse even works with a single battery, so you don't lose the connection if you change one battery at a time. Just like all other Logitech's modern gaming mice, this also comes with a million buttons that you can assign macros or custom keystrokes which comes real handy in games. I cannot believe how you can play games with a generic 3 button mouse these days. However, when it comes to marketing, the high DPI is not a marketing point with this mouse. The max DPI (or CPI) is limited to 2500, which actually makes sense. Even that is too high. Most people are fine at around 1000 DPI or even less. Maybe that helps save battery life. (Means, it is a technical compromise). However, the mouse comes with a new sensor, called Delta Zero. Maybe saving battery life is the main feature of it rather than performance. The wireless link is between a dedicated nano receiver that plugs into your USB port. it operates at 2.4GHz spectrum and the mouse works up to 3m away. That's good enough for me. It's not Bluetooth, so you will have to carry that nano receiver wherever you go. But remember, wireless is still laggier than wired. That cannot be fixed. They can make the difference smaller, but it will always lag behind wired mice. Most people won't notice it, but some gamers might. The only issue this mouse has is the Logitech's Gaming Software. With version 8.50, they have improved it a lot, but it still misses the active application every now and then and uses wrong settings for the application you want to use. Minimizing the application and bringing it back might work. Or maybe you'll have to open the Gaming Software window from system tray. Worse case would be to kill it from Task Manager and relaunch. But that's a lot of hard work. I also set the default configuration for games. So if I close all the programs running while gaming, I won't have an issue. It's the application switching that doesn't work well. The suggested price is $80 for the mouse. That is a lot of money for a mouse. I checked the prices in Japan, and the lowest I could find was JPY8,440. That's too much. I hope the prices will drop by my next birthday. 4.5 months to go. :) Maybe this will be my first step towards going wireless.